Not only is the Manitoba Legislature satanic, it is also blasphemous. Remember that occultists do now want the power of Christ to be manifest in them through realizing that Christ died for them. Instead, occultists want the power of Christ without allegiance to Christ. 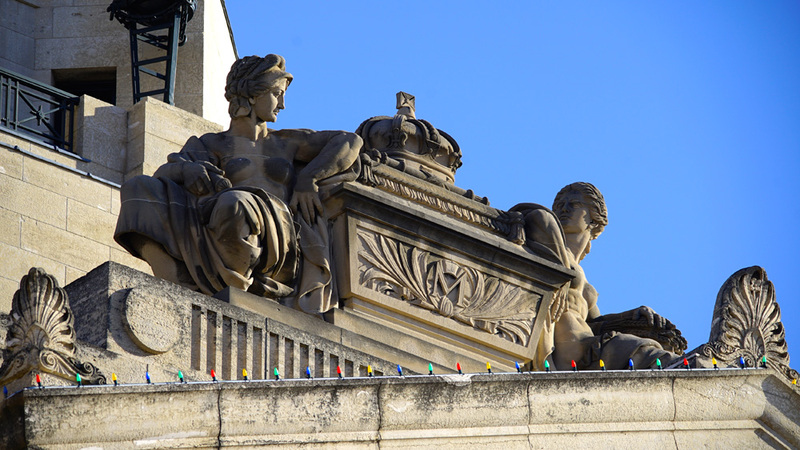 This is symbolically encoded through the lamp stands that surround the rotunda of the Manitoba Legislature. Twelve small lamps surround the sun (Son) of the larger lamp - just like the twelve disciples and Christ. Still not convinced? 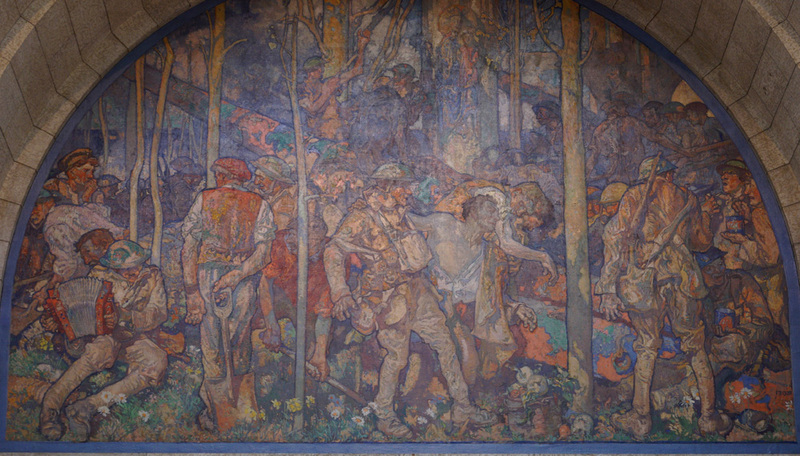 The mural that hangs over the entrance to the Manitoba Legislative chamber, painted by Frank Brangwyn, is not just a scene of a soldier being rescued during World War 1. It is a depiction of the death of Christ. You can just make out the image of the Madonna and Child at the top of the painting. 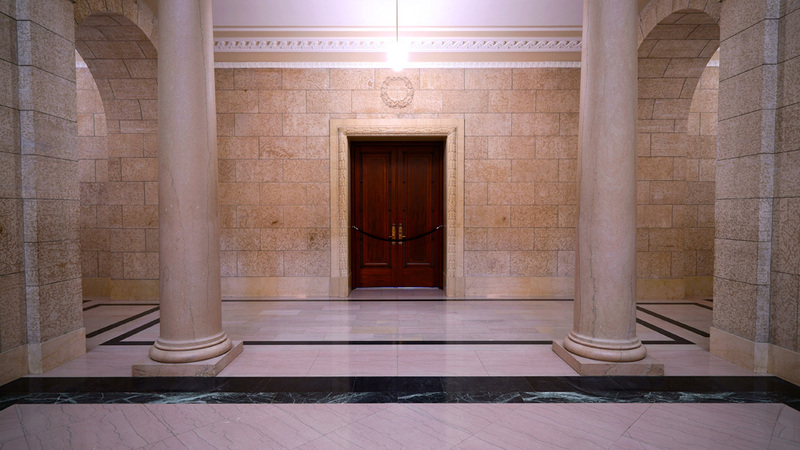 There is one room in the Manitoba Legislature without a name or a number. The public explanation for this room is that it is the lieutenant-governor's reception room. The private function for this room is that it is the Holy of Holies. This room has the same dimensions, in cubit measurement, that the Holy of Holies in King Solomon's temple had. The twin pillars of Jachin and Boaz, mentioned in 1 Kings 7, guard the entrance to this special room. The temple would not be complete without the Ark of the Covenant, flanked by two angels. The Ark sits high on top of the temple, inaccessible to all except monarchy and the elite, as depicted here. The elite of the world have always gotten involved in the occult. There is no greater example of this than King Solomon. The elite of the world have also always considered themselves as "gods" over the masses. The key to holding on to the reigns of power is to make the masses think that they are free, or dependent on the elite. Christ can accept this, instead of calling it a "conspiracy theory". I believe you are right Leonard. This is not a conspiracy theory. You are so thorough in your research. Based on watching your previous documentary and your various articles and interviews. Thank you for bringing such important facts like this to light. God bless you! Very interesting, 5 years ago would have shocked me. Today nothing shocks me. Once you realize how organized evil is in this world it becomes the norm. Without my faith in God could not take this world. Amazing, but not surprising. They are like the Islamic Caliphate they want the World for Satan (and themselves of course). I can see the Mother and child above in pic and I can also see them dragging what would be Christ through the street, center. Like Roman Catholic/Pope etc. they love crucifying Him daily and these like dragging Him and parading in His humanity part! I caught a snippet of your work at Canary Cry Radio/100th episode special. I have just been introduced to the magic money concept in the book from Mark Flynn, Forbidden Secrets of the Labyrinth, also and excellent book on the “Hidden Destiny of America” and more. Once you get all the different names down as variants of Nimrod/Osiris and Semiramis and Tammuz (Mother/Child worship= Queen of Heaven) Mystery Babylon it gets clearer and clearer what their end game is. As Nimrod is declared the hunter of men, men’s souls. I look forward to your next movie addition. Linda, you have discovered that truth is fractal. There are truths within truths that follow the patterns of larger truths on smaller scales. Satan loves sowing a spiders web of small lies based on imitating and distorting the massive truths of God.